East Valley Children’s Choir (EVCC) was founded in 1990 by Evangelical Formosan Church of East Valley as part of our church’s community service ministry. The primary goal of EVCC is to provide an environment for the community’s children to learn music, improve on musical talents and to experience the joy of singing in a choir together. An equally important aspect of the Choir is the nurturing and growth of discipline, responsibility, teamwork, and self-confidence. Currently, EVCC has over 100 members sectioned into Chamber, Concert, Junior, Apprentice and Preparatory groups. The choir practices every Sunday afternoon at Evangelical Formosan Church in Walnut. EVCC will sponsor winter and annual concerts each year in order to present the achievements of the choir to our community. 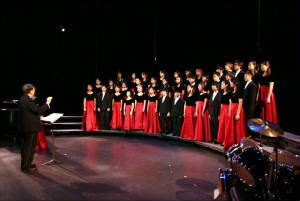 EVCC has also sponsored summer or winter musical camps, as well as other performances, concert trips, church worship performances, and community events.